The Prime Minister of Antigua and Barbuda reported that the entire population of Barbuda had been left homeless. The Prime Minister of Dominica declared that he had come to the United Nations “straight from the front line of the war on climate change”. Today I am announcing that I will travel on Saturday (October 7) to Antigua, Barbuda and Dominica to survey the damage and to assess what more the United Nations can do to help people recover, visiting of course also the operations that are taking place there. When I met them last month, I was struck most of all by a prevailing message from all the Caribbean leaders – including from the hardest hit countries. Yes, they said, we urgently need support today. But even in the wake of utter devastation, they urged the world to act for tomorrow. As I said in my address to the General Assembly, we should not link any single weather event with climate change. But scientists are clear that such extreme weather is precisely what their models predict, and they predict it will be the new normal of a warming world. I would like to share some relevant data about what we are seeing. First, some facts about this year’s Atlantic hurricane season. Hurricane Irma, which devastated Barbuda, was a Category 5 hurricane for three consecutive days – this is the longest on satellite record. Irma’s winds reached 300 kilometers per hour for 37 hours — the longest on record at that intensity. Hurricanes Harvey and Irma marked the first time that two Category 4 storms made landfall in the United States in the same year. And, of course, they were followed by Hurricane Maria, which decimated Dominica and had severe impacts across Puerto Rico. It is rare to see so many storms of such strength so early in the season. Second, some facts about the changes in major climate systems. Sea levels have risen more than 10 inches since 1870. Over the past 30 years, the number of annual weather-related disasters has nearly tripled, and economic losses have quintupled. Scientists are learning more and more about the links between climate change and extreme weather. Climate change is warming the seas. This, in turn, means more water vapor in the atmosphere. When storms come, they bring more rain. A warmer climate turbocharges the intensity of hurricanes. Instead of dissipating, they pick up fuel as they move across the ocean. The melting of glaciers, and the thermal expansion of the seas, means bigger storm surges. With more and more people living on coastlines, the damage is, and will be that much greater. Scientific models have long predicted an increase in the number of Category 4 and 5 hurricanes. This is precisely what is happening – and even sooner than expected. To date, the United Nations and its partners have provided a variety of humanitarian assistance to the Caribbean region by air and by sea: 18 tons of food; 3 million water purification tablets; 3,000 water tanks; 2,500 tents; 2,000 mosquito nets and school kits; 500 debit cards for cash assistance; and much else. We have launched appeals for $113.9 million to cover humanitarian needs for the immediate period ahead. I commend those countries that are showing solidarity with the Caribbean countries at this time of dire need, including those doing so through South-South cooperation. But on the whole, I regret to report, the response has been poor. I urge donors to respond more generously in the weeks to come. The United Nations will continue to help countries in the Caribbean to strengthen disaster preparedness, working closely with the Caribbean Disaster Emergency Management Agency. We are strongly committed to helping small island states and, indeed, all countries to adapt to inevitable climate impacts, to increase the pace of recovery and to strengthen resilience overall. 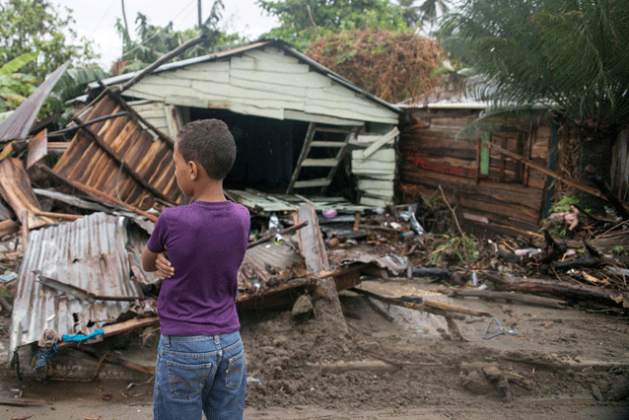 Innovative financing mechanisms will be crucial in enabling countries, like the Caribbean ones, to cope with external shocks of such significant magnitude. We know that the world has the tools, the technologies and the wealth to address climate change. But we must show more determination in moving towards a green, clean, sustainable energy future. Once again, I urge countries to implement the Paris Agreement, and with greater ambition. That is why I will convene a Climate Summit in 2019, as you know. But today and every day, I am determined to ensure that the United Nations works to protect our common future and to seize the opportunities of climate action.